ABSA Cape Epic is tomorrow! The time is upon us once more – tomorrow is the start of the 8 day, 743km event known as the ABSA Cape Epic! If you’re not in Cape Town yet, you better hurry up and get your toosh there! As you all may sadly know, fires ravaged the slopes of Table Mountain in Cape Town on late Tuesday night/early Wednesday morning. So far, the impact on the race has been minimal, minus the cancelling of a few practice sessions through the regions where the fire spread. However, I do suggest that you visit the official website (http://www.cape-epic.com) for up-to-date reports and general information about the race! I really hope they catch the idiot who caused this fire, because even though the race is still happening, he/she still destroyed the beautiful environment and endangered the life of thousands of people! I hope he/she doesn’t sleep at night knowing that they may get caught at any given moment! But I think we should all applaud the emergency and disaster management team that worked extremely hard to contain the fire. Many of these individuals will also be involved in this year’s race. Thank you for all your hard work! Regardless, let’s not let some idiot ruin the fun! 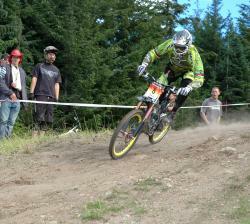 Get on that bike and endure one of the premier races in not only South Africa, but the world. Starting in Lourensford Wine Estate and ending in Somerset West, the ABSA Cape Epic will be just that – epic! This entry was posted in Events and tagged absa cape epic, bike, cape fire, cape town, cycle, cycling, event, fire, Lourensford Wine Estate, mountain, mtb, mtb shorts, shorts, somerset west, table mountain by mtbshorts. Bookmark the permalink.